At a Manhattan planetarium in 1965, ten-year-old Enzo is whisked away from his young adoptive aunt, Mala. His abductor turns out to be a blood relative: his great-uncle Junius Samax, a wealthy former gambler who lives in a converted Las Vegas hotel surrounded by a priceless art collection and a host of fascinating, idiosyncratic guests. In Samax’s magical world, Enzo receives a unique education and pieces together the mystery of his mother’s life and the complicated history of his adoption. Back in New York, Mala only knows that Enzo has disappeared. After a yearlong search proves fruitless, she enlists in the Navy Nursing Corps and on a hospital ship off Vietnam falls in love with a wounded B-52 navigator, who disappears on his next mission. Devastated again, Mala embarks on a restless, adventurous journey around the world, hoping to overcome the losses that have transformed her life. 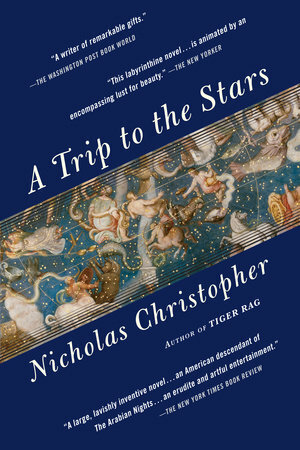 Fusing imagination, scholarship, and suspense with remarkable narrative skill, Nicholas Christopher builds a story of tremendous scope, an epic tale of love and destiny, as he traces the intricate latticework of Mala’s and Enzo’s lives. Each remains separate from each other but tied in ways they cannot imagine—until the final miraculous chapter of this extraordinary novel.